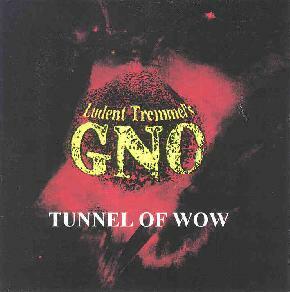 Ludent Tremmel's GNO - "Tunnel Of Wow"
Ludent Tremmel is a Connecticut based guitarist who plays heavy rock with fairly intricate song structures that often reminded me of King Crimson. Along with Tremmel, who also handles lead vocals, is Tony Castellano on bass and vocals, and Chris Weinland on percussion and vocals. Tremmel has a distinct voice that I'm not quite sure how to describe. Some may not like it, but it's certainly recognizable and is even a bit soulful. Songs like "Shine" and "Monkey Wrench" typify GNO's Crimson leanings. "Shine" includes heavy guitar driven rock with a metallic edge, but it's in a King Crimson-ish way being full of somewhat intricate rhythms and stinging guitar work. Adrian Belew would be a good comparison as Tremmel strangles single notes from his guitar similar to the way Belew does. "Monkey Wrench" features Discipline-era Crimson patterns, but also blasts off into rockin' jams with very cool guitar soloing against a tight driving rhythm section. I liked the complex rock structures but with nice a raw dirty edge. "Tunnel Of Wow" is similar to "Shine", but is more reminiscent of Led Zeppelin than King Crimson. "Reversed Thread" and "Interpretive Dance" are a little different having rhythms and guitar that reminded me a lot of early Police. "Reversed Thread" is the stronger of the two and has brief segments where the band returns to the heavy Crimson rockin' sound. A strange descriptive combo, I know, and the analogies are tenuous but I think they give a fair idea of how the band sounds. Another tune that strays into more varied territory is "Always", a slow bluesy tune with a jazzy guitar solo somewhat in the Holdsworth mold, but ends in a jam that brings to mind Jethro Tull. And at over 8 minutes, "Valley Of Fire" is the longest track on the CD, but the only one that didn't really hold my attention. It's got some good guitar work but the rhythm section lays back too much and I felt the soloing worked better on the other tracks when Tremmel blasts off without leaving the bass and drums behind. Overall, it's a solid rock album and stay tuned next issue as Tremmel's record company, Cleefo, sent me some discs that have additional projects from him and also from bassist Castellano. More information on Ludent Tremmel and his other projects can be found at the Cleefo records web site. Contact via snail mail c/o Myopicat Records; PO Box 766; Willimantic, CT 06226.